Bright and early on a recent Saturday morning, my aunt and I boarded a plane for West Palm Beach, Florida. Ok, so maybe it wasn’t so bright but that’s only because it was so early! 4am to be specific. It’s tough extracting yourself from bed when the sun hasn’t even plucked itself over the horizon yet. The promise of waves crashing on the shore was a pretty darn good motivator, as was the knowledge I would soon get to see my other aunt, uncle, and cousins who call Florida home these days. After a quick layover in Atlanta, we touched down at the West Palm Beach airport, picked up our rental car, and headed straight for our relatives home. There were hugs and excited chatter all around as we don’t get to see each other very often. We were all hungry for lunch so we headed out to the Old Key Lime House in Lantana. The place is huge and right on the water. The perfect place to start our mini vacation. I ordered the fish and chips, and I’m pretty sure the piece of fish I was served was bigger than my head. It was delicious! Of course I also had to have key lime pie while I was there. One of my top 5 favorite desserts. We parted ways so my aunt and I could check into our hotel, the Hilton Palm Beach Airport hotel. For being an airport hotel, it was incredible. The construction of the building was great, we didn’t really hear the planes coming and going unless we were outside. The rooms themselves were about what you would expect, nothing extravagant but comfortable and nicely appointed. Features that help it stand apart from the rest are their bar, Club 10, including the bar staff (they were all great! ), the complementary pizza in the evenings during happy hour, the small convenience store that I likened to a cruise ship shop, and topping it all off was the pool area. The pool was large, clean, and seemed to be heated, though maybe that was just the Florida sunshine. There were plenty of lounge chairs around and a few tables with umbrellas, as well as an area of cushioned seating, almost as if you were hanging out in your friends’ backyard. The best part was the setting. 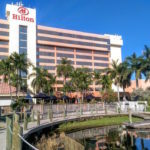 The Hilton Palm Beach Airport hotel sits on Lake Cloud and the pool area takes full advantage of the view. There is a dock so boaters and jet skiers can come right up on the property and relax with a beverage at the Tiki Bar. Then there is a lounge area at the end of a long dock for the hotel guests to enjoy. The ambiance really felt like a resort. 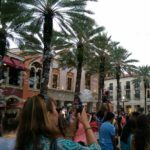 That evening, we went over to City Place to check out the last day of Bubblefest and have dinner. It was fun! There were bubble machines all over the plaza with live music and families enjoying time together. Sunday was a beach day!!! The best kind of day. 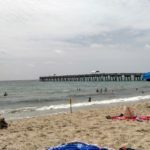 We went to Lake Worth Beach which is our local family’s usual haunt. There is a fishing pier and a restaurant, but more importantly surf and sand. Shops, a casino, pool, and a public restroom mean you should have more than enough amenities to keep yourself occupied and comfortable. We had a great day just relaxing on the beach and playing in the waves. We wrapped up our Sunday Funday by meeting a friend of mine for happy hour at one of the best kept secret bars in West Palm Beach, Charley’s Crab, and then headed over for a BBQ with my family. Very well described…can’t wait to read about the rest of the trip!